Ackman, who runs Pershing Square, has called Herbalife (HLF) "a pyramid scheme" and said he expects the Federal Trade Commission to shut down the company. He's made a billion dollar bet against the company's stock. The FTC has declined to comment on Herbalife, a company that sells nutritional supplements and weight loss products through a network of 3.1 million so-called distributors in 84 countries. At the conference, Herbalife trotted out its executives, including its president, chief financial officer and chief operating officer, who all explained that the company sells real products to real consumers. "If we were not a legitimate company why on earth would we invest and commit to hundreds of millions of dollars to products and distribution facilities?" noted Herbalife's president, Des Walsh during the meeting, which ran more than two hours. Just this week, Loeb's hedge fund, Third Point, revealed a new 8% stake in Herbalife, calling the company "well managed" and Ackman's claims "preposterous." 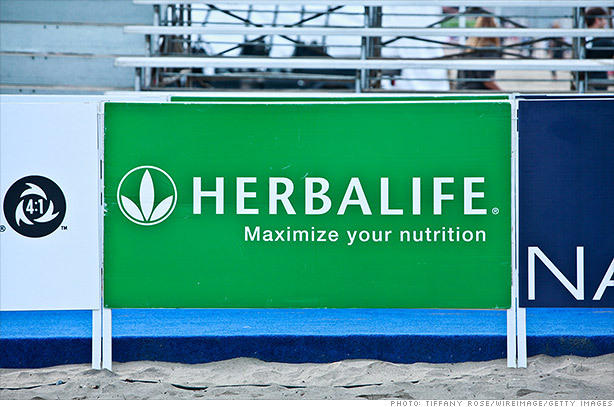 For the past several weeks, Herbalife's stock has been particularly volatile. Shares rallied more than 8% as Thursday's meeting got underway, putting it within spitting distance of where it was before Ackman launched his campaign against the firm. But the stock turned lower in the afternoon. In response to reports that the Securities and Exchange Commission had launched an inquiry into Herbalife, the company's executives would only say that they had reached out to both the SEC and the FTC about Ackman's charges. The SEC declined to comment. Herbalife executives also wouldn't answer questions about whether the company was considering litigation against Ackman, but Johnson said they'll use "every means available" to fight back. While management spent time during the presentation challenging certain assertions made by Ackman and questioning some numbers he used, the presentation was relatively light on the minutiae of the company's accounting metrics. When asked if Ackman's presentation made the company rethink any of its business or accounting practices, Johnson said Herbalife would reevaluate the company's vocabulary. Specifically, Walsh told CNNMoney in an interview following the meeting that the term "distributor" to describe the company's salespeople makes it difficult to understand who is selling products and who is simply consuming them. The question of who exactly buys Herbalife's products without being technically billed as a distributor continues to confuse investors. After the presentation, Ackman quickly fired back. "Herbalife promised to provide a detailed refutation of each of the facts that we enumerated in our December 20th presentation," Ackman said in statement. "Instead, the company distorted, mischaracterized, and outright ignored large portions of our presentation." Ackman won't be going away: "Pershing Square will be publicly releasing a detailed series of questions that will assist investors, regulators, distributors, and other interested parties in understanding the truth about Herbalife. Thereafter, we will respond with particularity to every issue raised today by Herbalife." 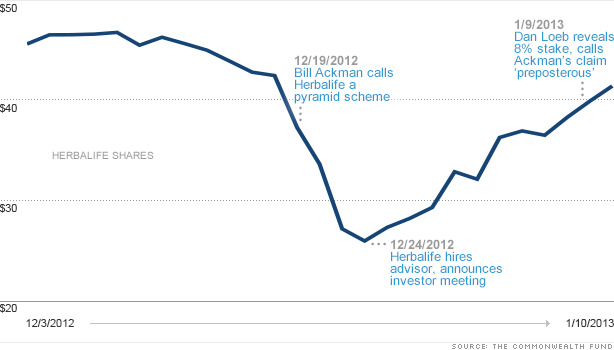 Herbalife told investors to expect to hear more from Ackman but that ultimately their business would prevail. Walsh told CNNMoney that the cost of fighting Ackman's claims would not have a material impact on the company's earnings in the current quarter.